Enbridge wants to offer landowners along the current Line 3’s 282-mile corridor a one-time payment to allow Enbridge to leave the decaying pipeline in the ground for future generations. In a now infamous statement, Minnesota Public Utilities Commission (PUC) member Dan Lipschultz complained that the Enbridge Line 3 pipeline proposal put a “gun to the head” of the PUC. If the PUC didn’t approve the new pipeline, Enbridge would keep running its old, decaying pipeline, risking a major spill in northern Minnesota, something Lipschultz and Commissioner Nancy Lange said they could not live with. The PUC could have done the responsible thing and pushed federal regulators and Enbridge to decommission and remove the old Line 3. It didn’t. Instead, the PUC chose to put Fond du Lac Band in a no-win situation, passing along the proverbial gun to the head. The PUC gave Fond du Lac the illusion of choice by forcing it to pick between two awful choices. Line 3 crosses the Mississippi River near Big Sandy Lake, a sacred site to the Anishinaabe. The PUC took that option off the table. The Band’s paramount concern is protecting and preserving both on-and off-reservation resources, and either [Route Segment Alternative] will have significant adverse impacts on the Band. The Band also preserved all of its legal rights to appeal the PUC’s decision in its letter. Comment: Unlike the PUC, which had another option to get out its supposed bind, the Fond du Lac Band did not have another option. Here are maps of the two alternative routes. For some, the headlines may imply that Fond du Lac is “selling out” and cooperating with Enbridge to accept another pipeline on their lands, but in fact, the Band’s assertive opposition to this pipeline has never wavered. (For reference, see the Band’s petition to intervene in the State of Minnesota’s regulatory process, and Chairperson Dupuis’s op-ed article, both from May 2017). Despite the Band’s opposition, however, the State’s approval of the project has put the Band in an impossible situation. 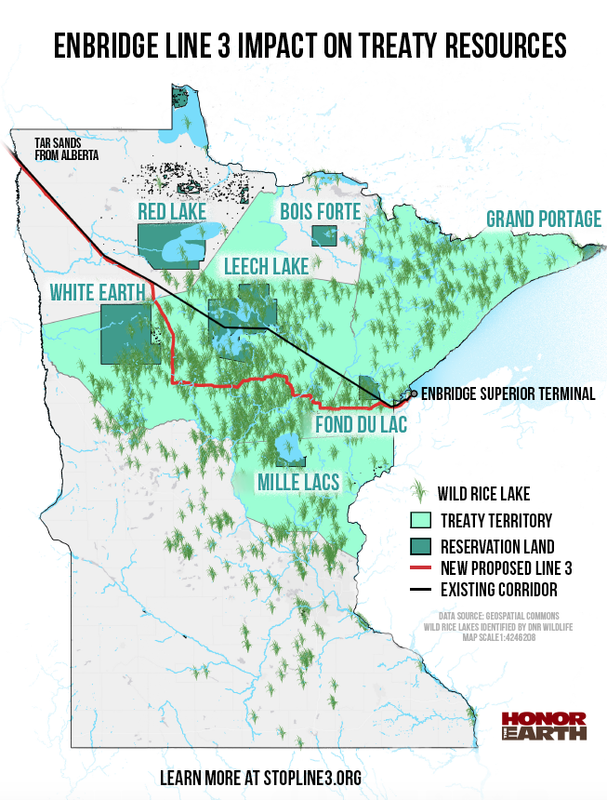 Tragically, a decision to allow the new Line 3 on its reservation may be the Band’s best option for minimizing impacts to the resources its members depend on for survival. RSA-21 eliminates crossings of, and increases separation between, the pipeline and the Sandy River. 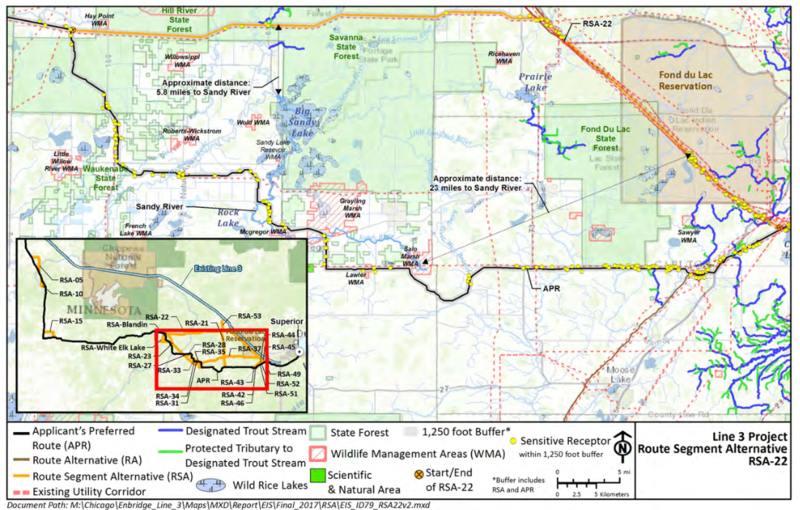 It does not eliminate impacts on wild rice waters, and it crosses an additional designated trout stream. 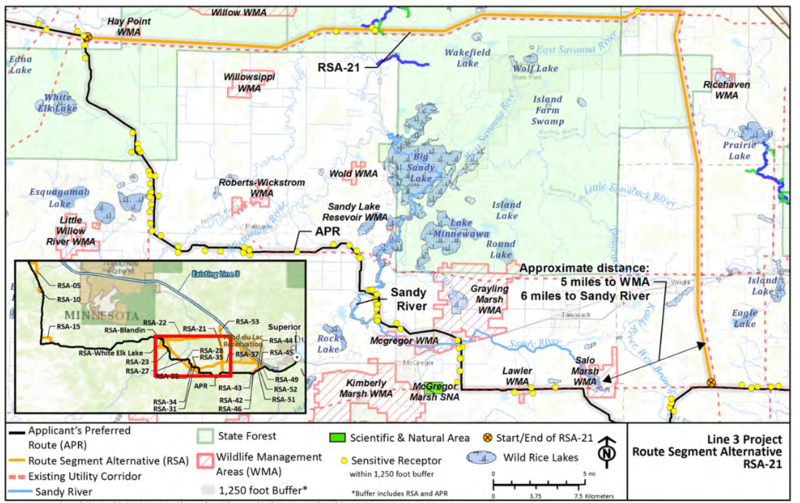 RSA-21 avoids crossing the Sandy River; however, it crosses the West Savanna River, Prairie River, and Tamarack River, all of which flow to Big Sandy Lake. The RSA also crosses a wetland that, based on desktop analysis, is hydrologically connected to the Little Tamarack River, which flows to the Tamarack River and into Big Sandy Lake. Therefore, while RSA-21 might eliminate potential impacts on the Sandy River from an accidental release of oil, it does not necessary avoid potential impacts on Big Sandy Lake. RSA-21 passes adjacent to Moose Lake, an identified wild rice water. It crosses the Tamarack River approximately 0.5 mile upstream of Tamarack Lake, a wild rice water. Additionally, the RSA crosses West Savanna River, Prairie River, and Tamarack River, all of which flow to Big Sandy Lake. 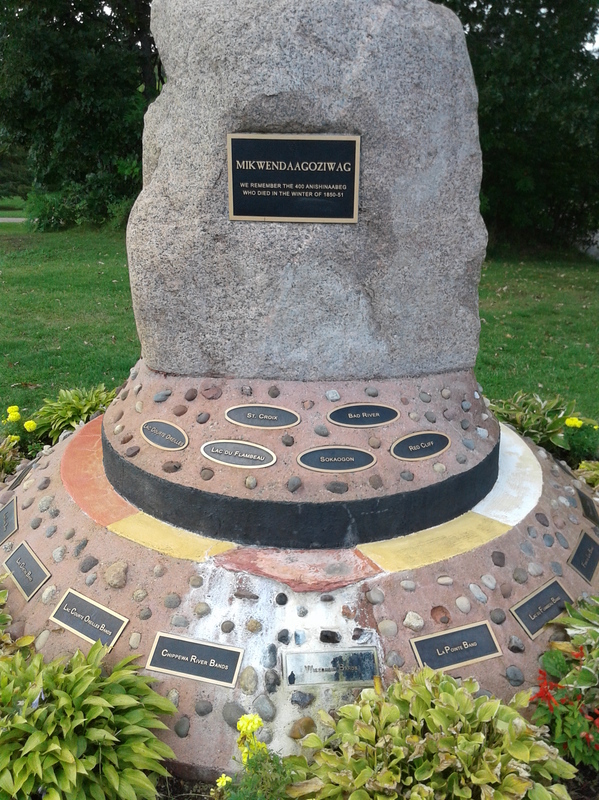 Marker near Big Sandy Lake remembers the 400 Anishinaabe who died there in 1850. What happened at Big Sandy Lake is a little known story in mainstream United States history, but the Anishinaabe people never forgot that more than 400 Ojibwe died due to the removal schemes of the state and federal governments. In the fall of 1850, Ojibwe from Minnesota, Wisconsin and Michigan tribes were due annuities from the federal government. These annuities were normally paid at La Pointe, Wisconsin, but the government informed the tribes that they must instead be at Sandy Lake in Minnesota by October 25, some 285 canoe miles distant from La Pointe. A few of the easternmost tribes refused to travel that far with winter approaching, but still more than 5,500 people made the journey for what was owed and promised to them. The lack of food and deteriorating conditions made the people sick, and at least 150 died from starvation, dysentery and measles. On December 2, a partial annuity payment finally arrived, but it was only three days’ worth of food with no money to purchase any more supplies. Most of the people saw there was no use in waiting anymore and began the journey back to their homes, though some stayed behind because they were too sick to travel. With winter set in, it was a harrowing journey, and 250 more died along the way. Note: An earlier version of this blog misidentified a member of the PUC. It is Nancy Lange. ← Events: Mendota Pow Wow; Mississippi Headwaters Line 3 Vigil; Iowa Climate March Against DAPL; and More!